On May 3, Petrobras’ Exploration and Production Director, Solange Guedes, received the OTC Distinguished Achievement Award for Companies, Organizations and Institutions, the highest recognition that an oil company can be given as an offshore operator. The awards ceremony took place during a dinner in Houston, USA, at the Offshore Technology Conference (OTC), the world’s largest event dedicated to the area of offshore oil exploration and production. Accepting the award on behalf of Petrobras, Guedes highlighted the importance of this recognition for the company’s technical staff and partnerships, as well as the roles performed by suppliers and the academic community. “Pre-salt exploration and production has been a challenging mission, which we are carrying out in close collaboration with our partners, suppliers and the technical and scientific community. 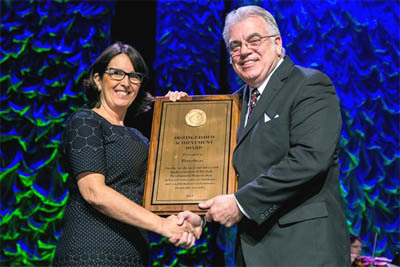 This award is the result of joint work based on an extensive network of cooperation,” she said. Guedes emphasized that, just eight years after the discovery of pre-salt was announced, the new oil province already accounts for more than 20% of Petrobras’ oil production in Brazil. After mentioning some technologies that led Petrobras to win the award (link to text about the technologies), the executive stressed that all the carbon dioxide produced in the pre-salt is being re-injected. “As a result, we have avoided the emission of 1 million metric tons of CO2,” she said, noting that this initiative increases the volume of oil gas extracted from the fields. The director recalled the challenges posed by pre-salt, located 300 km off the coast, without any installed infrastructure at the time of the discovery, and lying under a thick salt layer at a total depth of up to 7,000 meters. “This context represented a great opportunity to develop enabling technologies together with the industry. We realized that innovative solutions would be needed to extract oil from these fields in a safe, profitable and environmentally sustainable way,” she said. Finally, Guedes mentioned and thanked all Petrobras’ partners in its pre-salt projects and said she hoped these achievements will become a major technological legacy for the offshore industry.